A Child’s Garden of Verses – Everything is Oll Korrect! Poetically, it’s simple as can be. Rhymed couplets of four feet each, except the first line, though its short length and natural language keep it from getting monotonous. Yet, it’s charming because I remember, when I was very young, bed time being a significant concern for me, and in the summer time there was still some light when I had to go to bed – a problem I’m sure was worse for children who lived farther north than me. I think the book is of near-universal appeal, though there are a few cultural assumptions. One is the famous poem “Foreign Children” which is rather “Eurocentric,” as they say these days, or the multiple poems that assume the child has a nurse or the family has a gardener. Also, small details like doing things by candle-light, or “The Cow,” which will appeal to any child who likes animals, but which likely meant more to those who see cows in-person regularly, as much of Stevenson’s audience likely did. 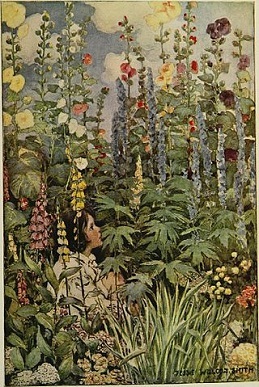 Many editions of A Child’s Garden of Verse are illustrated; mine uses those done by Jessie Wilcox Smith for a 1905 edition. They’re all lovely and add considerably to the book’s charm. 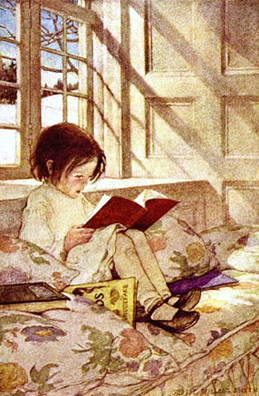 Yeah, I remember summer nights where there it was bright enough that I could read by window light. My poetry knowledge at that point was limited to Shel Silverstein, but I do get a warm feeling from these. I never read Silverstein, my first exposure to poetry was Dr. Seuss. I’m really not sure what the first lyric poems I would’ve read were. Thinking back, I can remember several prose works I read as a child, but no poetry.